1. I have traveled to every continent in the world except for South America and Antarctica. I was able to check one more off my list when my publisher flew me to Australia just this past May. 2. When I was in Kenya during the summer between my junior and senior years in High School (summer of 2000), I was almost fatally bitten by a black mamba snake. I did not know it was a venomous snake when I was playing with it (actually, I was trying to catch and pick it up), or obviously I would not have been touching it. It was also a baby black mamba, which means it’s venom was about 3x concentrated, and there is no way a bite would not have delivered a lethal dose. It tried to bite me several times before a local ran up and killed it. We were about 3 ½ hours from the nearest hospital. This was not the smartest moment of my life. 3. I am a direct descendant of Isaac Allerton, who was one of the signers of the Mayflower Compact, through my father’s side. He was my 12th great grandfather. 4. I have three sons between the ages of 6 and 17 months. My 17-month-old is named William Allerton. William for William Wilberforce, the great English reformer who abolished the slave trade in England, and Allerton for my 12th great grandfather. 5. Because my mom chose a German spelling for my first name – Karin – everybody used to mispronounce it when I was little. It IS pronounced CARE-in (common pronunciation), but people used to call me CAR-in (as in vehicle) all the time. When I was 5, my mom gave me the option to choose which pronunciation I preferred, saying she would honor my wishes. After much careful deliberation, I chose to stay with CARE-in. 6. I worked as a night security guard in college. Since I am a smallish woman, people often don’t believe me when I say this until my husband backs up the claim with the statement, “Oh yeah! You should have seen her mentally stun that police officer in training that one year. It was hilarious!” True story. I do know how to mentally stun. No, it is not via telepathy. One time a girl I was busting bit me. I kind of wish I had mentally stunned her. 7. My favorite book ever is The Lord of the Rings, which I DO treat as one book, as Tolkien intended. The year I met my husband in college was the same year the first movie came out. He and I went to see the movie (kind of our first unofficial date), but he didn’t know I was testing him. He’d never read the book before, so if he loved the movie, we were good to go, if he didn’t, the budding relationship probably wouldn’t work out. As you can probably guess, he loved it, read the books (beginning with The Hobbit, as everyone should! ), and ten months later wrote his marriage proposal into the front cover of a collector’s edition of The Hobbit that he gave me as a gift. I said yes. 8. I wrote my senior thesis in college on C. S. Lewis, of whom I am also a huge fan. When I got to take a trip to England that year and see Lewis’s grave in Oxford, I stood over it and cried. I also cried when I saw the Magna Carta in the British library on that same trip . . . but that might just be because I’m a big nerd. 9. I am a historian. I specialized in Latin and South American history in college, but I ended up teaching Ancient, Classical, and Medieval history at the school at which I still teach creative writing. Because it is a classical school, I didn’t have to work with some cookie-cutter government curriculum, but I had the freedom to create my own curriculum based on the primary sources already laid out for the course. So, in addition to writing YA fantasy novels, I’ve also written classical history curricula. My favorite source to teach was The Histories by Herodotus. I love The Histories so much I almost got giddy every time that time of the year came around. That is why there are a couple references to Herodotus and the Persian Wars in my books. 10. I began writing my first fantasy novel when I was eleven. At first it was called The Quest (original, right? ), but then I later renamed it The Seventh Kingdom (meh… little bit better). I picked at it all the way through Junior High and High School, and finally finished it sometime in college. Then, because I’m apparently delusional, I tried to get it published. After many well-deserved rejections and some good advice from a writer friend, I realized it was a ridiculous, no-good, mishmash of a story that needed to be appreciated only for what it was – practice. I shelved it and told myself I would write a new book, and I would do it the right way – with planning, preparation, and purpose. 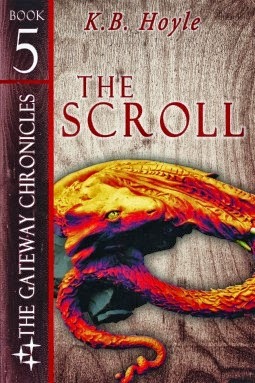 My next project became The Gateway Chronicles. 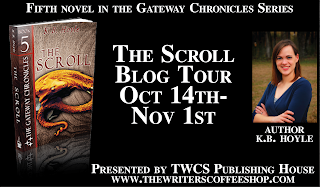 K. B. Hoyle is an author, a creative writing teacher, and a former classical history teacher who uses her knowledge of the ancient and medieval worlds to pen fantasy tales for young adults. She has been married since the age of twenty to the love of her life, with whom she has three wonderful little boys. 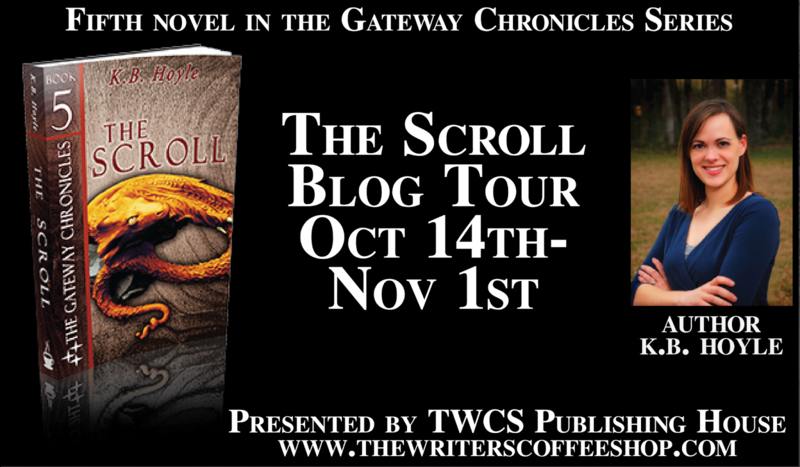 Her quest to write inspiring fiction began at the age of eleven when she started her first fantasy novel. The pen truly is mightier than the sword, and K. B. has always viewed her writing as a way to introduce truth, beauty, and goodness into the hearts and minds of young people. K. B. is currently writing the Young Adult Fantasy series The Gateway Ch r on icle s, and Breeder, the first in her New Adult Dystopian trilogy, and she never stops brainstorming all the stories she plans to write in the future. Girl Who Reads is an Amazon advertising affiliate; a small fee is earned when purchases are made at Amazon through the above link. The views, opinions, and beliefs of contributing writers are their own and do not necessarily reflect those of Girl Who Reads. This post is part of a GWR Publicity promotional tour paid for by the author.